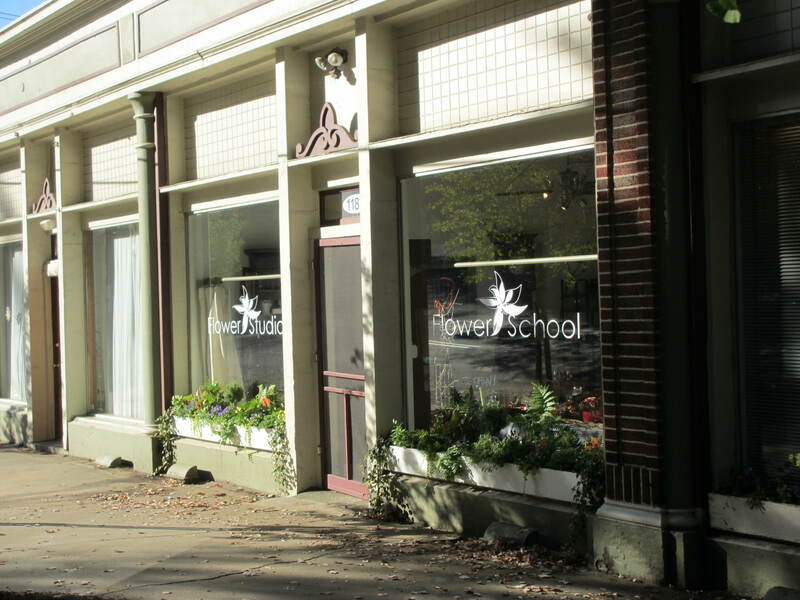 I traveled to Atlanta, Georgia last week for two days of classes at Faith Flowers School & Studio. 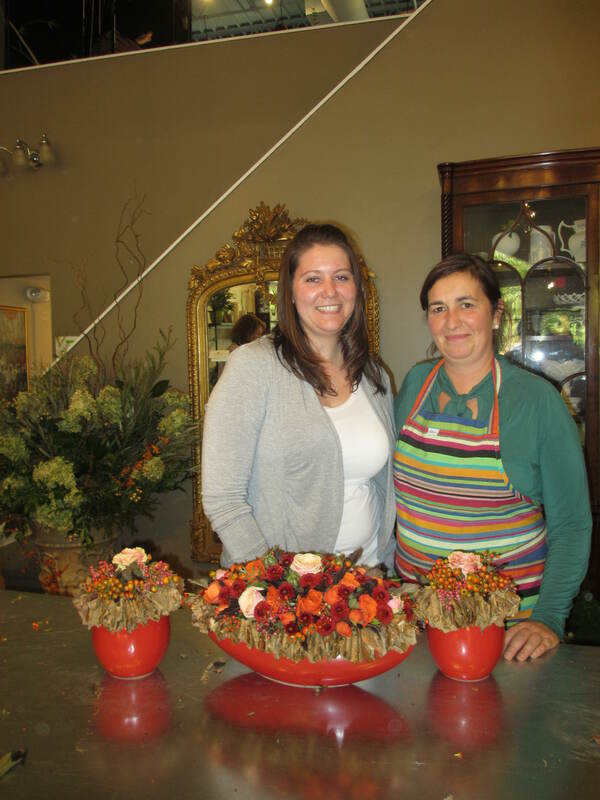 Laura Iarocci and Victoria Denson are the owners of the Design Studio and Flower School. Below is a picture of the Faith Flowers. Laura just recently moved into this space and it’s absolutely charming! I’m not even sure where to start in describing my experience in Atlanta except to say that it was exceptional. These classes were exactly what I have been looking for and were worth every single penny I spent! They really were affordable considering all the information, ideas, and hands-on experience we received from our instructor. 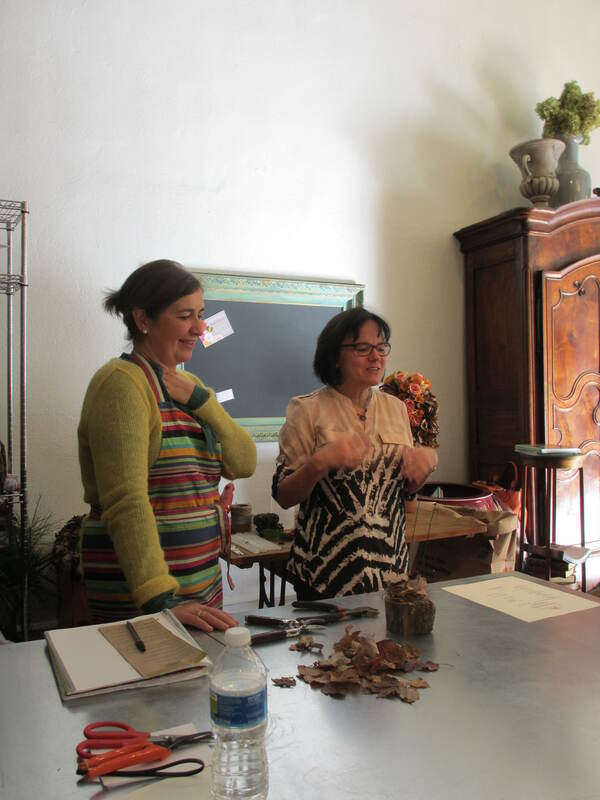 Gudrun Cottenier was our instructor for both days and she flew in from Belgium just for these classes. 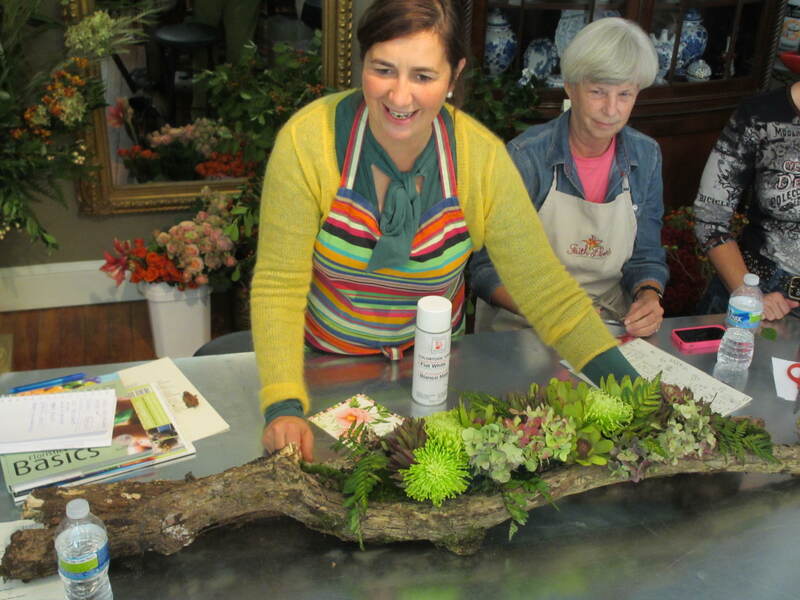 Gudrun owns the largest and oldest private flower school in Belgium, De Groene Verbeelding Bloemschikschool, and she is an expert when it comes to European Floral Design. She has authored two books, works for a Belgian Food & Flower Magazine, is the first and only female on the Flower Board for the country of Belgium, is a mother, and just simply a lovely person! We started the day off with Gudrun demonstrating idea after idea of how to implement her philosophy of using “what we have” and “what we find in nature”. 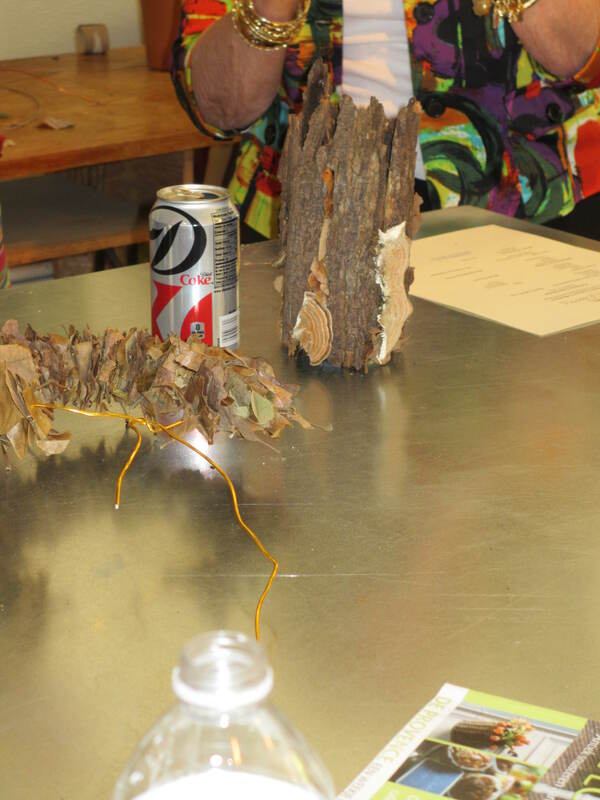 She showed us idea after idea of designs we can create using items like coke cans, bark, leaves, recycled bicycle innertubes, branches, logs, etc. I was astounded with what she created from these everyday things. She was kind & patient and took time to give each of us advice and show where we could improve our pieces. She knew just where to put an extra berry or stem of greenery to complete an arrangement and fill in our holes. I loved watching her work! Here is just a sampling of the ideas she showed us. 1. Gudrun’s idea of recycling coke cans. 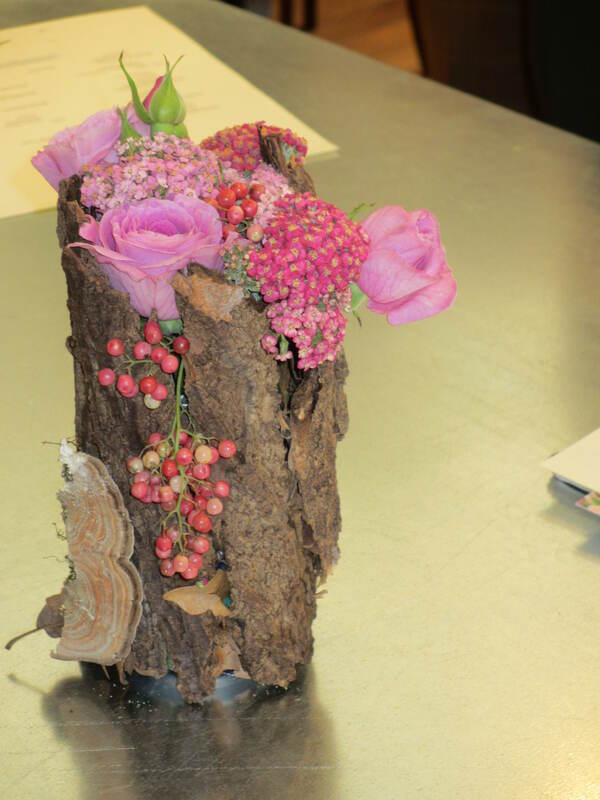 Gudrun used a coke can and pieces of bark to create a beautiful vase. 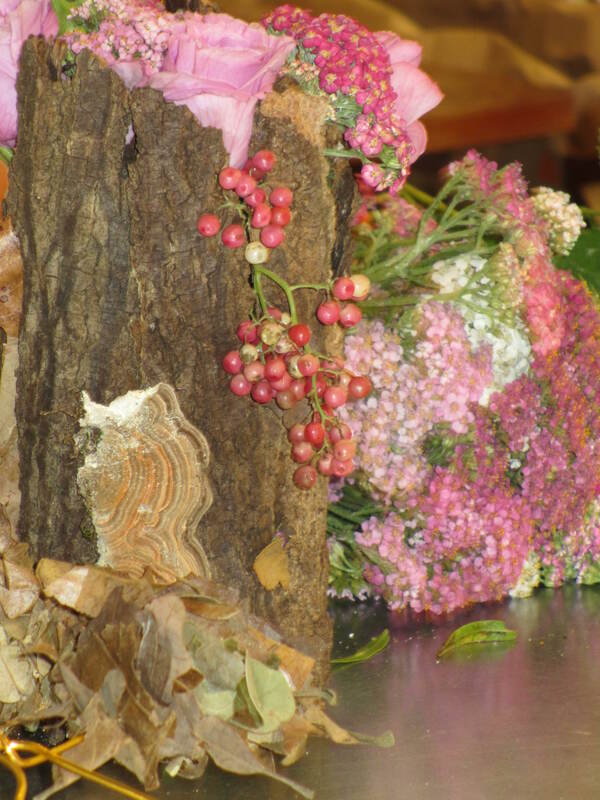 Gudrun filled the bark vase with roses, cottage yarrow, and pepper berries. This was the finished product. 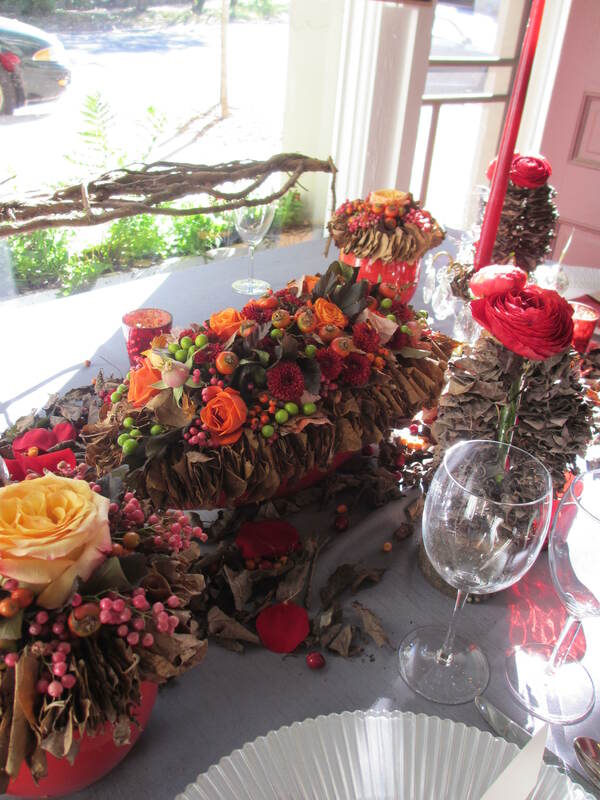 Can’t you just imagine 5 or 7 of these arrangements lined up down a table to create a gorgeous centerpiece?!! The pictures just don’t do this creation justice. It’s 3 1/2 – 4 feet long. It was beautiful, innovative & fresh! 3. 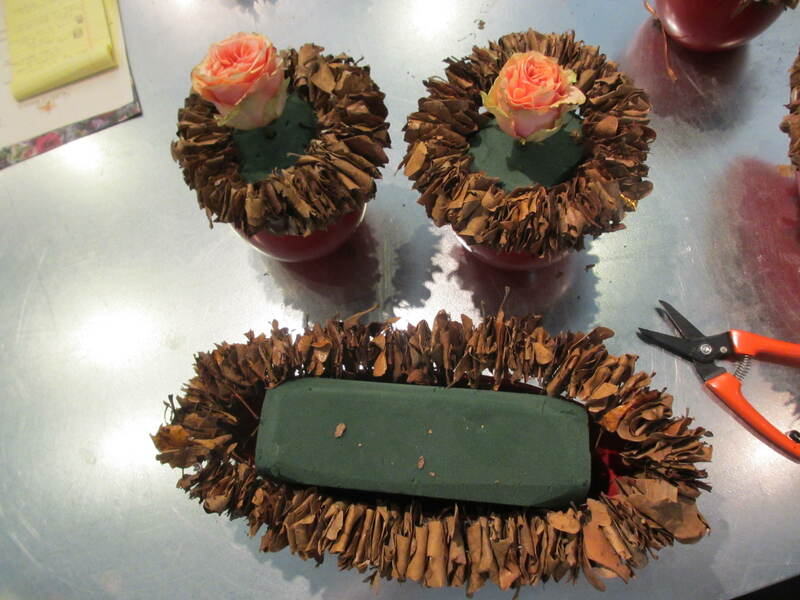 Gudrun recycles items (like toilet paper rolls) and creates napkin rings out of them. 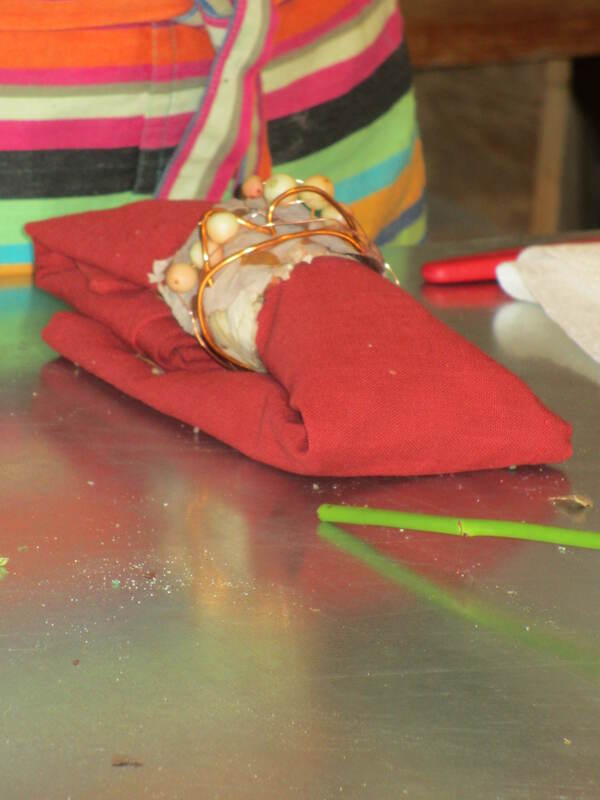 Gudrun created a napkin ring out of a toilet paper roll, leaves, a little scrap of wire, and a few berries. This isn’t the best picture but you get the idea. She uses everything and makes the most beautiful things out of nothing! We went through PILES of leaves before we were finished. 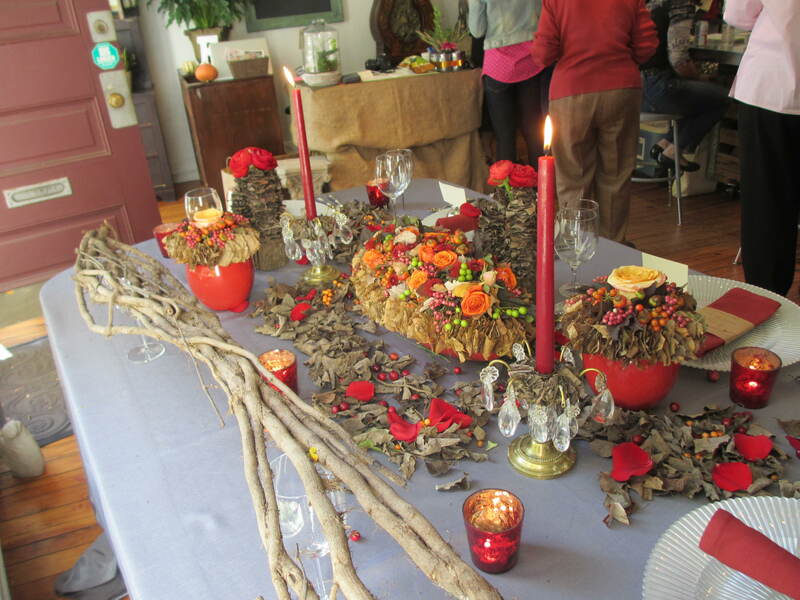 Here are the finished leaf garlands. They took me about three hours to complete. 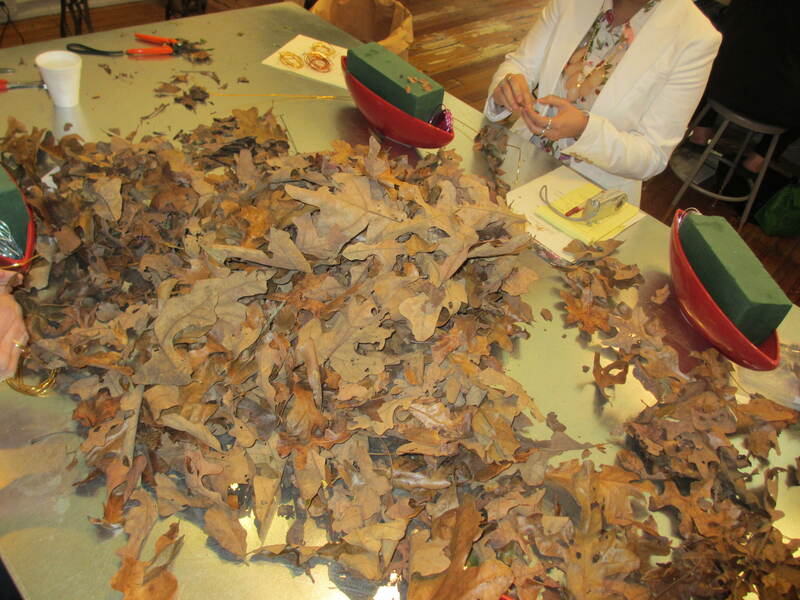 We were all “leafed” out by the time these were finished. It goes much faster though once you get the hang of it. 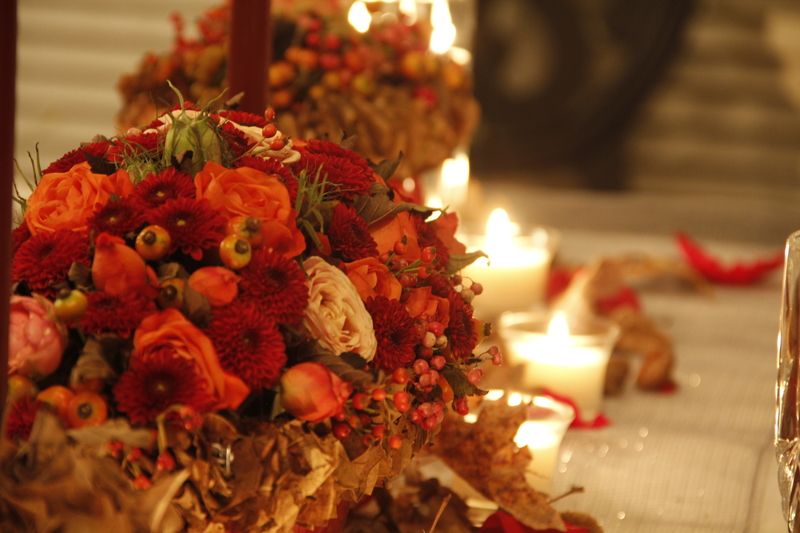 Gudrun knew these were time intensive but wanted us to have something that lasted after the flowers had faded. They are sturdy and will last forever! 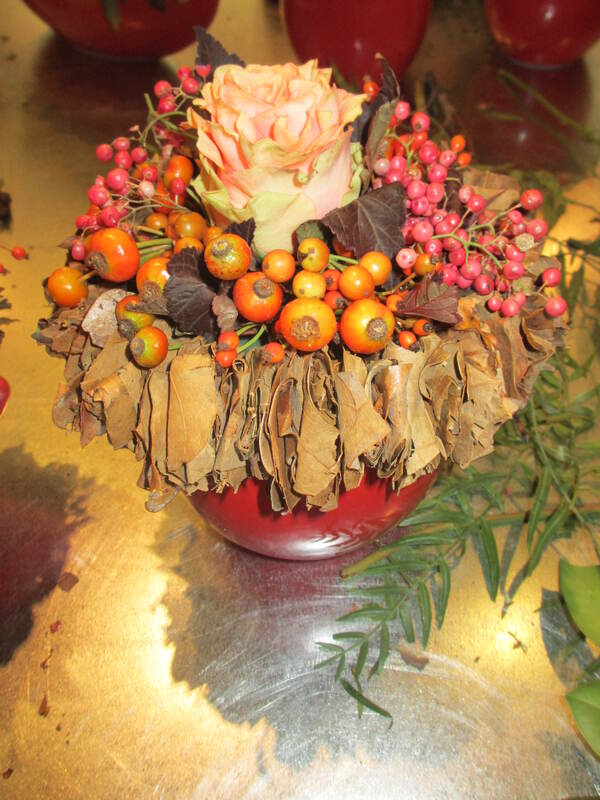 We designed three low, compact arrangements using Garden roses, spray roses, rosehip, coppertina leaves, pepper berries, holly berries, and chrysanthemums. The arangements were gorgeous!!! Here are a few picture of my finished designs. 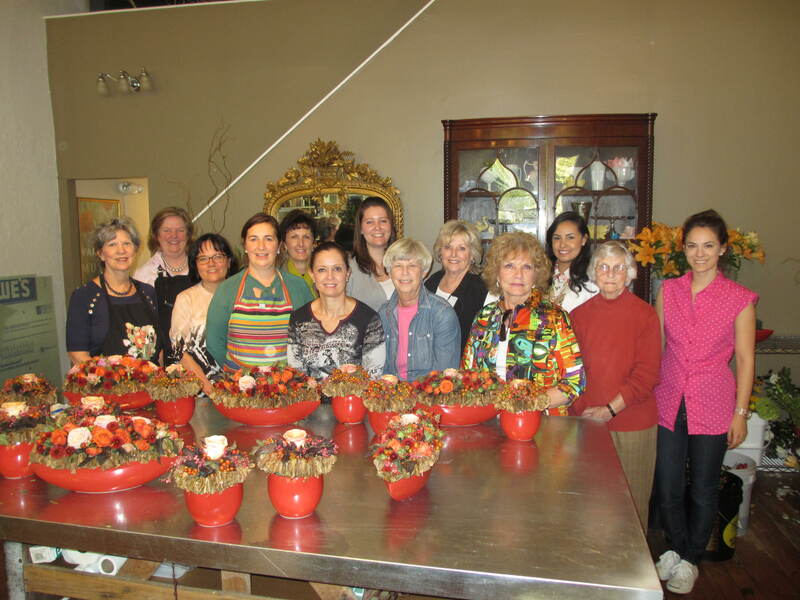 Below is a picture of our entire design class along with Gudrun & Laura, as well as their table design showcasing the arrangements we designed that day. I love how full everything is yet it’s low enough to carry on a conversation with other people without blocking everybody’s views. 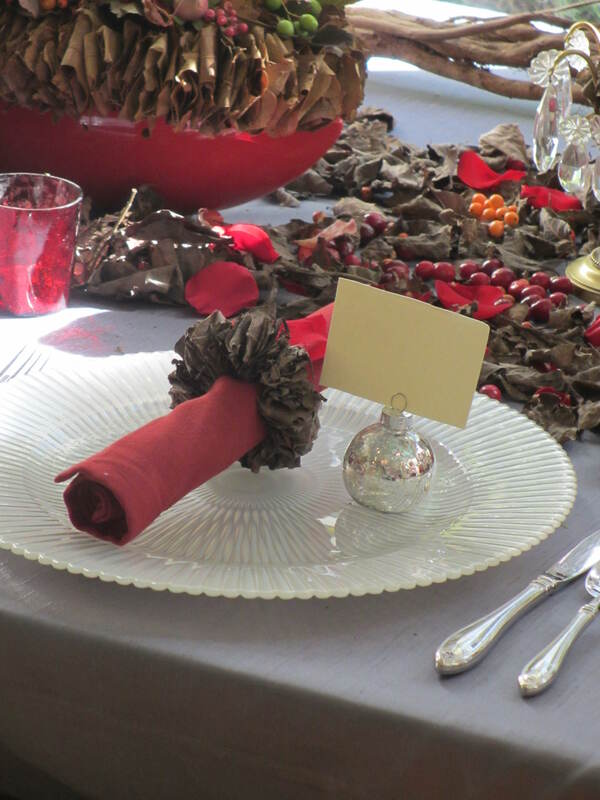 Gudrun created a napkin ring out of a leaf garland. Do you see a pattern here? 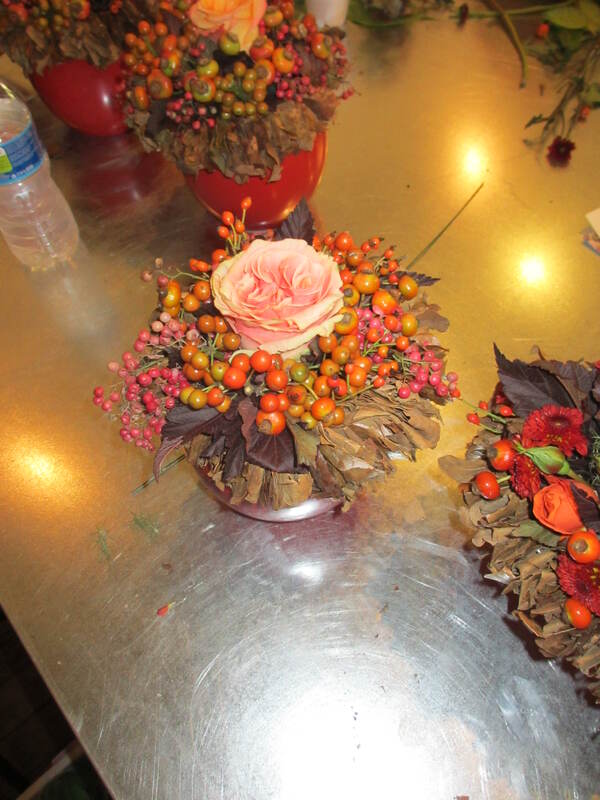 She emphasized repetition throughout your arrangements to tie everything together. Gudrun and Anna with my finished designs. I think this is one of my favorites. What do you think? 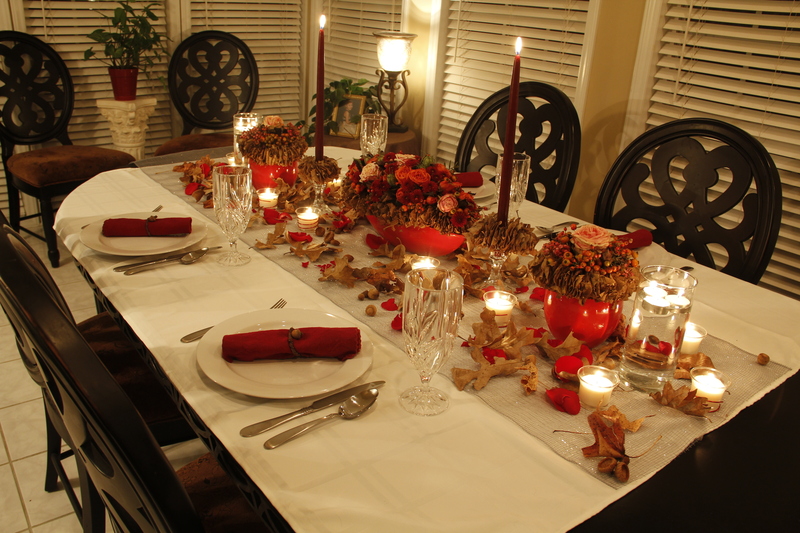 Coming soon, European Christmas Designs with Gudrun Cottenier. Thanks Annie! I learned a TON. Looks like you found your Flower Artist Soul Mate! Lovely, lovely work, very nice…thankful the LORD worked it out for you. I was lucky to have seen them in person … BEAUTIFUL work!